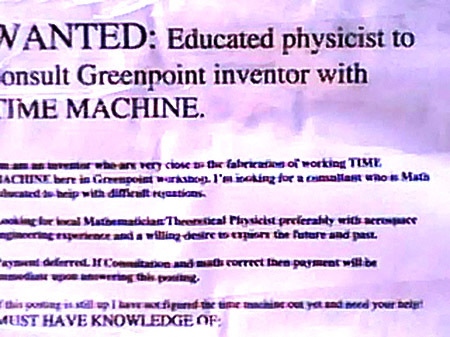 …thought you might find this interesting.Â Not sure if you’ve seen this yet, but this flier was posted on the street lamp on Franklin and Greenpoint Ave., right outside of the Pencil Factory this morning.Â Obviously, my cell phone picture is less than great quality, but apparently someone who is close to building a time machine in Greenpoint is looking for physicist to work on some of the numbers for said time machine. Not sure if it’s a hoax or not, but it’s entertaining nonetheless. I am an inventor who are very close to the fabrication of working TIME MACHINE here in Greenpoint workshop. I’m looking for a consultant who is Math educated to help with difficult equations. Looking for local Mathematician/Theoretical Physicist: preferably with (unintelligible) engineering experience and a willing-desire to explore the future and past. Payment deferred. If Consultation and math correct then payment will be immediate upon answering this posting. UPDATE, February 27, 2009: You can see this advert in some semblance of entirety by clicking here. I believe the “unintelligible” is aerospace. Also, I was trying to figure out how one would be paid upon answering the posting but also after all math and consultation are correct. How would you do the math without first knowing the problems? Then I remembered…time machine! I suppose that means if you answer the posting and they hand you a check then you’ll eventually succeed. If you answer and receive no check then you might as well give up then and there. I’d say the chances of this being an part of an art installation or guerrilla marketing for some indie movie are pretty good.